We can undo the policies facilitating police violence in Ferguson. In the last week, the ACLU, Color of Change and even libertarian Senator Rand Paul have demanded that militarized policing in the United States be dialed back. While it is essential that major reductions in the high-tech military presence of police be enacted, real changes in the way communities of color are policed require much deeper shifts in the core mission and function of American police. Much of the militarized weaponry seen in Ferguson comes directly from the Pentagon through the 1033 weapons transfer program begun in 1997. This program has resulted in the distribution of $4 billion worth of equipment. Local police departments can get surplus armaments at no cost—and no questions asked about how they will be used. Small and medium-sized communities across the country now have access to armored personnel carriers, assault rifles and a variety of so-called “less lethal” weaponry such as rubber bullets and pepper spray rounds. Compounding the effects of 1033, the Department of Homeland Security (DHS) has also given out $34 billion in “terrorism grants” that have been a tremendous boon for military contractors trying to expand their reach into civilian policing markets. In response to the events in Ferguson, US Representative Hank Johnson from Georgia has sent a letter to members of Congress expressing his intent to introduce a bill ending the 1033 program. The passage of this bill, as well as the ending of DHS terror grants, needs to be combined with federal restrictions on the use of military equipment in order to prevent the kind of militarized response seen in Ferguson. One of the uses of this new hardware has been specifically in the suppression of dissent. While many big-city departments have resisted this trend, many others, along with hundreds of medium-sized and smaller cities, have invested millions in body armor, riot shields and less lethal weaponry . Some of this technology was on display in several cities during the Occupy movement. An article by Radley Balko, author of The Rise of the Warrior Cop , in last week’s Washington Post lays out the danger of such strategies. Departments need to return to less intensive protest policing, which is cheaper, more effective in maintaining order, and better for overall police-community relations. Police need to rely on better communication, flexibility and tolerance rather than ever-more-intensive command-and-control strategies . Federal courts need to expand First Amendment protections to enhance not just the right of speech but also the right of assembly, which has been greatly abridged in recent decades. Since 9/11 there has been a tremendous expansion of the surveillance and intelligence-gathering functions of local police in conjunction with federal authorities. The Department of Homeland Security has funded the creation of dozens of anti-terror fusion centers across the country. Since the actual threat of terrorism in places like Helena, Montana, and Jefferson, Missouri, is so minuscule, they engage instead in broad surveillance activities, partnering in some cases with local businesses to do political threat assessments targeting peace activists, the Occupy movement and many others. In October 2012 the US Senate Permanent Subcommittee on Investigations issued a report showing that these centers had not generated any information relevant to terrorism and criticized DHS for resisting any effort at oversight. Congress should end this program and enact restrictions on the gathering and sharing of intelligence independent of specific criminal activities. Some of this unrestricted surveillance is carried out by new police drones. Departments across the country are using or exploring this technology with little or no oversight. The possibility of massive invasions of privacy, violations of the Fourth Amendment and even the death or injury of members of the public from armed drones raises major concerns. Federal regulations are needed to restrict the use of this new technology to ensure that their use is narrowly tailored to legitimate law-enforcement purposes, and that constitutional standards are met regarding privacy, intelligence-gathering and use of force. 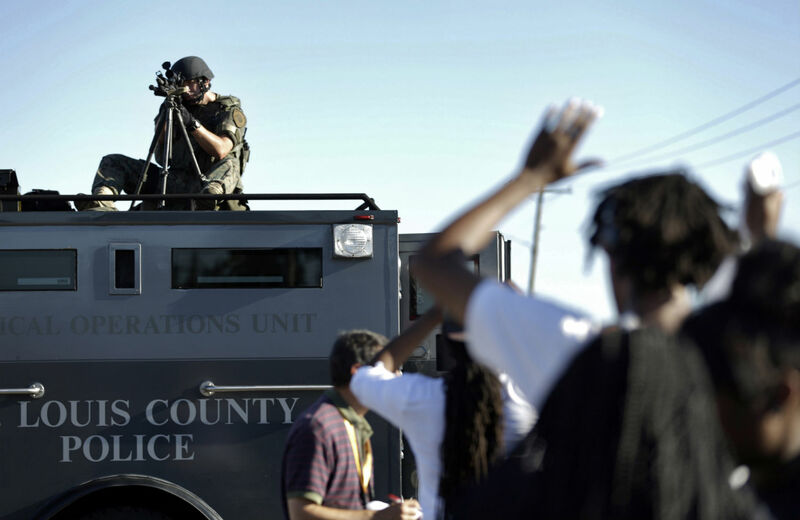 Special Weapons And Tactics (SWAT) teams have become the primary consumers of militarized weaponry and tactics. Federal incentives and “mission creep” quickly shifted the role of these teams, originally created during the panics about political violence in the 1960s and ’70s, to drug enforcement. Peter Kraska, author of Militarizing the American Criminal Justice System , shows that the number of SWAT teams exploded over the last thirty years, and their role has expanded too. Heavily armed teams are almost never used for their original purpose of dealing with hostage situations or barricaded suspects. Instead, their function is now to serve warrants, back up low-level buy-and-bust drug operations and patrol high-crime areas. Much of this expansion was driven by federal policies that funded the equipment for such teams either directly or through asset forfeiture laws. The increased use of paramilitary units has resulted in dozens of incidents in which police have wrongfully killed or injured people. The most horrendous of late was the throwing of a flashbang grenade into the crib of an infant during a Georgia drug raid in May. The toddler was severely burned and entered a coma. No drugs were found and no arrests made. So far none of the officers have been charged with any crime or formally disciplined. In fact, the local prosecutor threatened to charge family members for the child’s injuries. This near total lack of accountability for botched raids, excessive use of force and the dehumanization of suspects must be corrected. Local DAs cannot be counted on to hold police accountable because of their close daily cooperation with the police. Independent offices of police prosecution (“blue desks ”) need to be established at the state level, and the Department of Justice needs to be more aggressive in intervening in cases where no local action is taken. The expansion in the number of paramilitary police units has been accompanied by an increase in military-style training. Former military personnel have launched a massive market to train normal patrol units in paramilitary combat. Patrol units are often introduced to such training as a way of fostering team identification and military-style camaraderie. These trainings fly in the face of the fundamentally civilian nature of policing. In the UK, the police (who mostly do not carry firearms), rely heavily on the concept of policing by consent, which emerged from the earliest thinking about civilian police in the early nineteenth century. Any policing that loses the support of those policed will not be effective and will lead to an escalation of conflict and the use of force, creating a vicious cycle. This is exactly the cycle we are in now as ever-more-aggressive policing has undermined public support for the police, especially in communities of color, and engendered more resistance and escalation, as seen in the case of Eric Garner, who was killed by police in New York City earlier this summer. Ultimately, what underlies most of these militarized forms of policing is a cynical politics of race that has perverted criminal justice policies; they are no longer about crime or justice, but instead the management of poor and non-white populations through ever-more-punitive practices. Michelle Alexander, in The New Jim Crow, describes how modern criminal justice policy was driven by a Republican effort to appeal to white voters in the South and then by Democrats hoping to inoculate themselves against charges (i.e., the notorious Willie Horton smear) of being soft on crime. One of the most pernicious expressions of this has been the War on Drugs, which opened the floodgates for a massive intensification of policing in the United States. In many parts of the country, low-level drug arrests remain the primary means by which young people of color end up in the criminal justice system. To reverse this trend, we must move to end the War on Drugs by legalizing and regulating not just marijuana but all drugs. Portugal’s decriminalization of drugs has both reduced crime and the public health harms associated with drugs. Drug use should be understood as a public health matter and taken out of the realm of policing. Christian Parenti reminds us in Lockdown America and The Soft Cage that the history of the police in the United States is a history of racism, and the militarization of policing is one expression of that history. While individual officers and police executives may be motivated by the best of intentions, as long as they continue to be the primary tool for managing social discord, poverty and even crime, we will see a continuation of the over-policing of communities of color. It is this dynamic that is the most difficult to address, and the most important. We must invest in social policies that end the criminalization of poverty and attempt instead to deal with problems like drug abuse, homelessness, mental illness and even violent crime as public health and economic justice issues. We need to reinvigorate our mental health systems and rely more on civilian crisis response teams. In many communities homelessness has become a major source of social disorder; the solutions are real investments in affordable housing, wage supports and social services, not “quality of life” policing. Across the country, community-based organizations, sometimes working with local health departments, are addressing youth violence through peer mediation, gang truces and youth development rather than gang databases and mass criminalization. While we may always need some state body to exercise force in the interests of the common good, that use of force should be limited, proportional, and always the last resort, not the first.